In a shallow baking dish, combine 1/4 cup oil, the chopped garlic, the salt and crushed red pepper. Add shrimp; toss well to coat. Set aside to marinate at room temperature for 30 minutes, tossing once or twice. In a 12-inch skillet, heat remaining 1/4 cup oil over medium-high heat. Add the sliced garlic; cook until just beginning to turn golden. 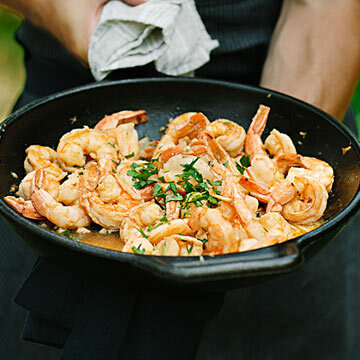 Immediately add shrimp and juices to skillet in a single layer; cook, undisturbed, for 1 minute. Sprinkle with paprika; turn shrimp and cook 1 minute more. Remove skillet from heat. Carefully add sherry, return to heat and cook, tossing shrimp, until liquid is slightly reduced, 1 to 2 minutes more. Remove from heat. Swirl in butter and lemon juice; season to taste with additional salt. Sprinkle with parsley and serve straight from the pan.